Managing dependencies in the application lifecycle is a difficult task. There may be numerous relationships between several types of artifacts in trackers, and in complex projects, hundreds or thousands of dependency relations may need to be managed. With bigger projects, the sheer volume of data renders issue management difficult to handle. In structures as complex as some software systems are, a lack of overview on these relations can drain major resources. Considering the complexity of managing multiple projects and issues, e.g. developing software with various modules, with the help of several teams that all work to create software and fix bugs, and of course the continuously changing requirements, issue management is a task that may seem daunting. In such a complex environment, gaining a high-level overview and being able to access details of dependency relationships between all artifacts is invaluable. To ensure traceability, it's essential to be able to select, filter and access the dependencies you're looking for, whatever types of artifacts they are, and whatever projects they may be in. So how does this affect the application lifecycle? In software development, the more dependencies you have to manage, the less velocity your team(s) can achieve, and the more that piece of software will cost you. Regularly updated requirements can have a ripple effect: change one section of the code that many other modules depend on, and the dominoes start to fall. Thus, improper dependency management or a lack of traceability can result in reduced efficiency and increased costs. How does one effectively plan, track and cover dependencies throughout the SDLC process? Naturally, by taking advantage of smart tools that have been created specifically for that purpose. The new Traceability Browser introduced in our latest version, codeBeamer 7.4, was designed to help identify dependencies between all tracker types including requirements, bugs, issues, releases, tasks, change requests, etc. It offers unlimited flexibility in searching for and filtering dependencies across tracker types and projects. The Traceability Browser saves you and your team a great deal of time by visualizing incoming dependencies (associations and/or relations) in a user-friendly dependency matrix. Using the Traceability Browser to ensure visibility will let you easily filter dependencies across all your projects. The drag-and-drop feature allows you to simply select what tracker types and relations you'd like to see displayed. Suspected links are also visible in the dependency matrix. What's more, the Browser is able to display task statuses, showing you what tasks or issues are in the 'to do' section, have been (partly) completed, or postponed. 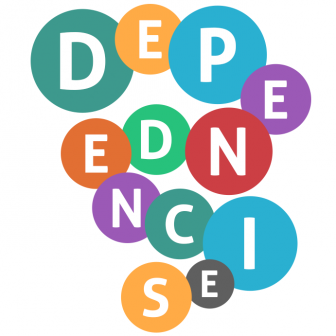 The results of the dependencies query can then be exported into an Excel sheet, allowing it to be shared with other teams to facilitate further work with the dependency matrix. 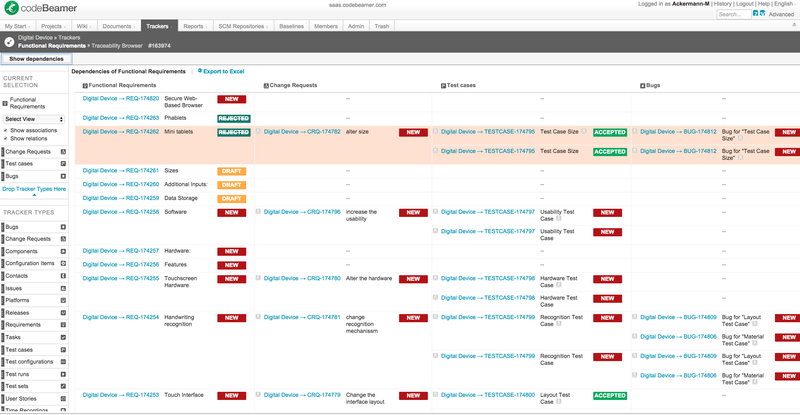 The Traceability Browser helps you keep track of changing dependencies when updating requirements, in order to enable you to make sure every item of the new requirement has been covered. It is a practical, easy to use and powerful tool that facilitates the managing of dependencies, saving you time and costs in the process. To find out more about the capabilities and features of codeBeamer ALM around traceability, contact Intland Software or start your free trial!